The scenic Town of High River at the foot of the Rocky Mountains has seen its share of floods. The Highwood River that runs through it has spilled its banks more than a dozen times over the last 100-plus years. But it was the most recent flood in 2013 – the devastating deluge that brought High River to national attention – that threatened the Alberta town’s very existence. When the waters receded across many southern Alberta communities, including parts of Calgary, High River was the hardest hit. Three people died. Hundreds of homes were deemed uninhabitable and had to be torn down. Many more were damaged but repairable. The downtown’s infrastructure needed to be replaced, and many businesses sustained millions of dollars in damage. Fast forward four years and the town of more than 13,000 is on the rebound. And perhaps no better measure of its return to its previous promise is the community of Montrose by Dream Development. “We’re doing a re-launch,” says Trevor Dickie, vice-president, Planning and Development Calgary Land for Dream Development. 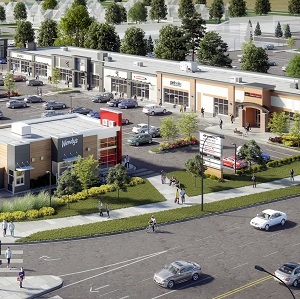 The Western Canadian developer with a diversified portfolio of communities in Calgary, Edmonton, Saskatoon, Regina and many smaller municipalities has been working on Montrose for more than a decade. The flood has been its most significant challenge, but the developer has also had to contend with the Great Recession in 2008-09 as well as the recent downturn in the energy sector. Yet the company persevered and now aims to complete its original plans and then some. While existing homes suffered only basement flooding and did not need to be demolished, the bridge connecting the community needed to be repaired. And the clean-up was massive. Tonnes of mud, silt, downed trees and other debris had to be removed from roads, parks and ponds. But Montrose was fortunate compared with other parts of High River where homes and businesses had floodwaters flow through their main floors – causing significant structural damage. Other homes built in neighbourhoods on floodplains needed to be moved, part of the $100 million in flood mitigation measures that now protect High River from rising waters up to a metre higher than in 2013. Salvageable homes were actually auctioned off earlier this year at a fraction of their original cost to buyers willing to move them. Although High River is riding high again, it still faces an image problem, says Jodi Dawson, the town’s manager of economic development. “We have to get the message out to the investment world and people in general that we’re here and we’re thriving – come see it,” she says. Among the biggest selling points is Montrose – and High River in general – offers more for less. “If you compare new homes of similar size, probably on a slightly smaller lot, in south Calgary to the new areas of High River, we’re talking about $100,000 less – say from $470,000 down to $370,000 for a similar product,” Dickie says. Many of the same amenities found in larger communities are there as well. Montrose itself featured key businesses, like a Co-op grocery and wine store, even before the flood. Now others are coming, including a Mr. Mike’s Steakhouse, with several thousand square feet under development, worth millions of dollars. “The original premise of Montrose is that it would appeal to someone working in south Calgary,” he says, adding the community is about 20 minutes drive from the city’s edge. In 2006, Dream recognized the town at the edge of the foothills and prairie had the potential to be “the next big thing” location for development. It is home to a thriving art and culture community, including the film and television industry – serving as the location for CBC’s Heartland. After more than a decade, Dream’s gambit looks to be fulfilling its promise. While the flood was devastating, it also presented an opportunity for a complete reboot, especially for future development. “Daring to be different and innovative has been council’s strategic vision,” Dawson says. Besides making downtown more walkable with expanded sidewalks, council in April approved new land-use bylaws reducing planning zones from 41 to six and even eliminating the R1 designation. “We now have the ability in the traditional residential districts to be supportive of a neighbourhood coffee-shop and other beneficial businesses,” Dawson says. Even before council passed the new development plan, High River had seen an uptick in growth with 20 new businesses opening in the first quarter of the year. All of these efforts earned another type of recognition, with the Town of High River being honoured with an Award of Merit at the annual Building Resilience Conference in Calgary. The award, presented June 19, recognized the 2015 High River Downtown Area Redevelopment Plan and Pubic Realm Revitalization. Overall the message couldn’t be clearer, Dawson says.